With winter fast approaching, it’s time to make some decisions about heating your home. While it may seem overwhelming trying to decide between so many heating options, choosing the right heat pump can be made easier by considering their unique features. Firstly, heat pumps are incredibly efficient. Also, despite their name, heat pumps do a lot more than heating. During the warmer months they also offer air-conditioning and can control the humidity in your home. Speak to a qualified heat pump specialist today. Unlike a typical heater, heat pumps actually don’t generate heat themselves, rather, they move it, during winter transferring warm air from outside into your home, and during summer, warm air out of your home. Because heat pumps move heat rather than generate it, they run more efficiently and cost less that typical air conditioner or gas heaters. Heat pumps also come with unique features that other heating options can’t offer. When shopping around, be sure to choose a brand name that you trust. Consider the warranty on offer, the cost of installation and how long the heat pump is likely to last your family. Be sure to check the Energy Star rating when making your purchase. The more efficient your heat pump is the lower your annual running costs are likely to be. Spending more in the outset may even work out cheaper in the long term. Most heat pumps are very quiet inside of the house because your fan is outside. When choosing your heat pump be sure to ask about the decibel levels. The right heat pump will make your home more comfortable rather than add problems with noise. In 1968, Mitsubishi Electric released their first split-system heat pump. Since then, they have established themselves at the forefront of heat pump technology. For New Zealand specifically this has seen industry-leading technology performing perform exceptionally well unique weather conditions, across summer and winter. Kiwis have trusted Mitsubishi for decades and we do too. Talk to a heat pump specialist about our Mitsubishi heat pumps. Say goodbye to drafty heating and cooling that either makes one room feel like an oven while the rest of your home remains freezing (or vice versa). 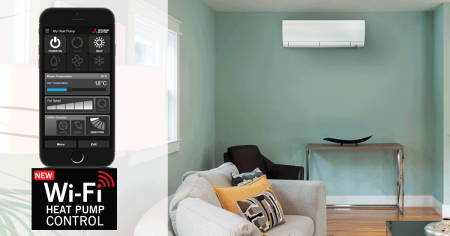 Mitsubishi’s technology produces a natural airflow that gently heats and cools the home. As you can see, there are quite a few features to consider when it comes to choosing the best heating option for your home. The best way to decide for sure which option is the right one for your home is to meet with one of our qualified heat pump specialists.